A NEEMO engineering crew diver simulates anchoring to an asteroid surface. Move over, Bruce Willis: A team of NASA divers working under the sea to bring what, until now, has been the realm of science fiction — sending astronauts to an asteroid — a bit closer to science fact. The diving team is tackling a set of engineering tests for an upcoming NASA asteroid mission simulation on the ocean floor near Florida. This week, a vanguard team of divers is setting up mock asteroid terrain and tools to be used by real astronauts during the 15th expedition of NASA's Extreme Environment Mission Operations, or NEEMO 15, at the Aquarius undersea research laboratory off the coast of Key Largo in the Florida Keys. The tests are required to ensure that all systems are ready for more rigorous testing when the NEEMO 15 crew of "aquanauts" will be living full-time in the Aquarius undersea habitat, NASA officials said. 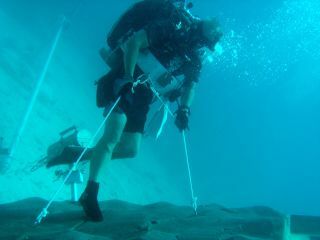 NEEMO diver anchoring on a simulated asteroid surface. "They tested hand-over-hand translation with anchor points on the rockwall, foot-restraint ingresses, anchoring in the silt to stabilize the setup, and using a rigid standoff attached to the waist ring for body stabilization," NASA officials wrote on the NEEMO 15 blog. NEEMO 15 will primarily focus on three different aspects of a mission to an asteroid: anchoring to the surface of the asteroid; moving around on the surface using a method of connecting multiple anchors to form pathways; and investigating different methods of sample collection. Artist's concept of anchoring to the surface of an asteroid. "Body movements made on the ocean floor while "almost" neutrally buoyant are similar to what astronauts would face when moving across the surface of an uncharted asteroid," agency officials wrote on the blog. NASA's current space exploration goals, announced by President Barack Obama last year, are aimed at sending astronauts to an asteroid by 2025, then taking aim at a Mars expedition in the 2030s.